What was once a midway point for timber and coal traveling by barge from across Lake Washington, South Lake Union has recently transformed into one of the most hip and highly developed areas in Seattle. Located in the heart of downtown, South Lake Union is certified LEED by the U.S. Green Building Council. 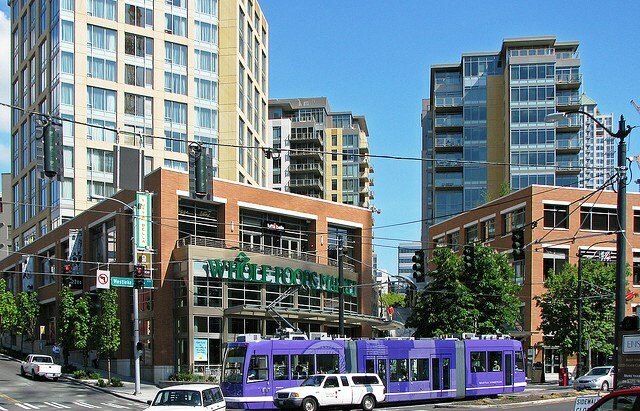 Seattle Biomedical Research Institute on Westlake was one of the nation's first silver-level LEED lab buildings, and the South Lake Union Streetcar is Seattle's first modern electric streetcar, extending 2.6 miles to neighborhood amenities and connecting to additional transit systems. Numerous other life science organizations as well as high-tech corporations, the Center for Wooden Boats, Museum of History and Industry, and newly developed Lake Union Park are popular attractions that dominate South Lake Union. Real estate in South Lake Union offers a convenient and sustainable lifestyle in the heart of the city with supermarkets, parks, Seattle Center, Lake Union, trendy bars, public transportation, and a wide variety of restaurants all within walking distance. Homes for sale in South Lake Union include LEED-certified condominiums with lake views, floating homes for sale along Fairview and Westlake Avenues, and townhomes near lower Queen Anne for sale. South Lake Union condos for sale in Seattle are equipped with luxurious features including open floor plans with floor-to-ceiling windows, spacious gourmet kitchens, private balcony, master bedroom suite, radiant heat, and walk-in closets. In addition to offering a comfortable and sustainable lifestyle, South Lake Union's SLU Card allows neighborhood residents discounts at area restaurants and services.